Can you believe that about half of US based small businesses don’t have websites? Seriously. Websites have become so commonplace in today’s day and age; it’s odd to think that there are still businesses out there without any web presence. At the same time, there are tons of design options to choose from and so many similar websites that it can be tough to know exactly how to stand out. It’s not just typography and color selection. 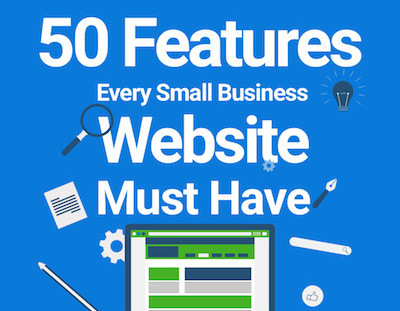 There are many obvious and non-obvious features that are critical to the success of small business websites. A visually appealing logo, social media widgets and contact info, a domain name and hosting — these are just a few of the obvious items. But what about functions that assist with client support, or data capture, or even analytics tools. There’s a lot going on behind the scenes when developing an effective website, and it’s important to understand exactly what features will bring you the best results. Check out the infographic below to see an overview of top features, as well as SEO tips and technical aspects to consider. Convinced that you have some work to do on your website? Contact us today for your free consultation. SEO Strategy: What Matters in 2016 End Gerrymandering Now!